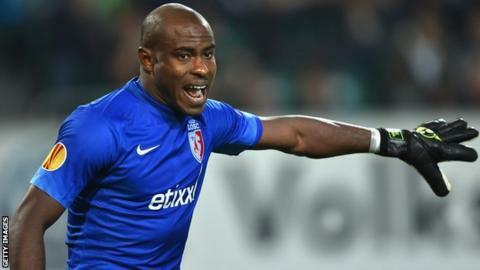 Nigeria goalkeeper Vincent Enyeama hopes the 2015 Africa Cup of Nations is cancelled to help stop the spread of the deadly Ebola virus. Hosts Morocco have asked the Confederation of African Football to postpone the 17 January to 8 February event but the organisers have refused. Enyeama said: "I really hope it doesn't happen. It is risky, in Africa everyone is hugging you and shaking your hand. "But if Caf says it will happen I will play - if Nigeria qualify." Moroccan officials are set to meet with Caf on 3 November to discuss their request to postpone the tournament. The Ebola virus has already claimed more than 4,500 lives since the outbreak in west Africa in March and Moroccan youth and sports minister Mohamed Ouzzine fears a big sporting event with large gatherings of people could lead to many more cases. Caf has already approached South Africa, Ghana and up to five other countries about hosting the event should Morocco withdraw. However, South Africa have said "it is impossible" for them to host the tournament, while Ghana have said they need to look into the cost of holding the event as well as the risks posed by Ebola. Ghanaian officials will also need to take into account public opinion that appears to be strongly against the Nations Cup coming to the west African country. A group has been set up on social media, called 'Say no to AFCON 2015'. Caf officials are scheduled to meet in Algiers on 2 November to discuss the situation regarding the tournament, which has never been postponed since its inaugural edition in 1957.